While enjoying some nice weather in the Charlotte, NC area, an 11-year old girl, her father, mother, and older sister took an early evening walk in their subdivision. The family walk was pleasant until a neighbor opened her backyard gate, whereby one of the neighbor’s dogs immediately bolted across the lawn, across the street, and directly toward the startled family. The dog next circled the family in a threatening manner. After completing one circle, the dog immediately launched a vicious attack on the young girl. The first bite was insignificant. However, the second bite severely tore into the tricep muscle of the girl’s left arm. The dog latched tightly while shaking the frightened girl to the ground. The wound bled profusely. Several minutes elapsed before the girl’s father could forcibly remove the dog’s jaws from the arm of his distraught daughter. An ambulance arrived to take the girl to the nearest emergency room. 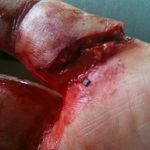 Emergency room doctors sutured the deep and long laceration. However, her injuries went beyond the merely cosmetic. She needed to see a neurologist due to paresthesia in the arm- an intermittent sensation of tingling or “pins and needles.” She needed to see a mental health professional due to symptoms of post traumatic stress disorder that caused her to become agoraphobic (fear of open spaces) in her neighborhood and cynophobic (fear of dogs). The agoraphobia resulted in weight gain as she became hesitant to leave the house after arriving home from school. The fear of dogs resulted in the family canceling plans to acquire a pet and in the victim having panic attacks when seeing large dogs. In addition, in accordance with doctors’ instructions she could not attend physical education class for several months. Consequently, she became depressed and her grades suffered. In addition, she needed plastic surgery to reduce physical scarring from the attack. Considering the significance of the physical and emotional damages, her father commenced a civil suit on behalf of is daughter. However, the neighbor’s insurance company refused to budge from an inequitably low initial offer that covered only existing and anticipated actual damages. Plaintiff’s counsel then engaged CPT to help strategize the case. CPT’s expert witness role included composing deposition questions, composing questions for a private investigator, aiding in researching the dog’s behavioral history, interpreting data, providing insight regarding the dog’s breed origin and behavior, and providing insight regarding the neighbor’s actions and knowledge. CPT expert witness Mark Spivak also remained available to move beyond a consultative role if the case failed to settle and there became a need for depositions or trial testimony. The major sticking point was an acknowledgement of negligence. The Defendants (a married couple owned the dog, although only the female spouse was present during the event) stated that they had no knowledge of the dog’s aggressive propensity. However, upon CPT joining the legal team, the private investigator was able to locate and question the parent of a child that had received over 20 stitches from the dog just a year earlier. Yet, the Defendants insisted that the previous injury was accidental and occurred when the dog was “playing” with the child. To impeach the Defendants’ argument, CPT constructed a detailed expert witness report that considered the elements required to establish tortious negligence. The report explained the duty the Defendant owed the victim, the breach of the duty, the cause in fact of the injuries to the Plaintiff, and the proximate cause, whereby with clear logic CPT established that a reasonable and prudent person would have understood that the injury to the face of the first youngster denoted aggression, not play, and that the Defendants afterward failed to take any action (training, behavior modification, exercise, prophylactic management protocols) that would better safeguard the community. In addition, the report documented the Defendants’ admission that they did not have full control of the animal, that he was rarely socialized, that he was energetic and difficult to handle, and that they had physical ailments that inhibited their ability to control such a sizeable and powerful animal. Lastly, the report explained that the dog was from a breed known for aggressive behavior and that the dog acted similarly with the victim to how a breed member would act when hunting wild boar, the breed’s typical working role. After seeing the report during mediation, Defense counsel capitulated. They admitted negligence and significantly raised their offer, whereby the case settled favorably prior to trial.